Synopsis: The true story of Homer Hickam, a coal miner’s son who was inspired by the first Sputnik launch to take up rocketry against his father’s wishes. 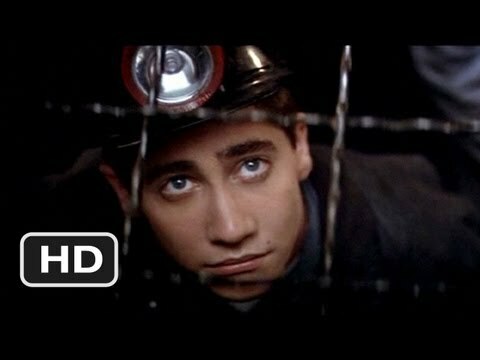 Watching October Sky is like watching a Hollywood biopic of the 30s/40s; it eschews flashy modern film-making techniques in order to tell its straightforward (and old-fashioned) tale, yet curiously fails to capture the 50s period in which it is set. However, this, some overly melodramatic moments, and the occasionally predictable plot development are the only flaws in what is otherwise a hugely enjoyable tale based on the early life of NASA rocket scientist Homer Hickam. Jake Gyllenhaal (Prisoners) is practically flawless as Hickam, an amiable young man growing up in an ailing Virginia coal-mining town (the grimness of which is emphasised by the use of blue tint) who becomes obsessed with building rockets after seeing the Russian Sputnik satellite sailing across the sky one night. Encouraged by a young teacher (Laura Dern – The Fault in Our Stars – employing a southern twang that would have held any adolescent male pupil in thrall to her), and aided by a couple of friends and the school geek, Hickam struggles against the objections of his father to realise his dream. Sometimes, October Sky plays as if it really was written by one of those 30s scriptwriters who paid little attention to fact in order to create a riveting story out of an otherwise uneventful tale. But the quality of writing is such that the occasional dip into melodrama can be forgiven. The montage sequence of failed launch attempts is hilarious, and makes it almost impossible for the viewer not to exalt with the Rocket Boys when they finally manage a successful launch. The character of John Hickam, Homer’s stern father, is finely etched, and complemented by an outstanding performance from Chris Cooper (The Muppets, The Amazing Spider-Man 2), who adds depth and pathos to what could have otherwise been a stereotype character. The strained and fiery relationship between father and son provides the core of the story, and Gyllenhaal and Cooper work well together, making their scenes believable, and making the eventual heart-warming outcome believable while avoiding the ever-present threat of over-sentimentality.